With so many amazing fish to choose from, why try and create our own? But unfortunately there are plenty of man made fish out there. Here's our top ten of some of the worst. We're all up for science having genuine benefits to health, but put it in the wrong hands and useful gene technology can quickly become the next cosmetic money maker. 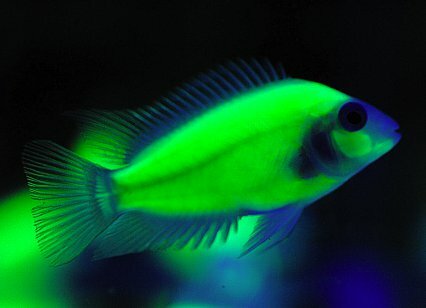 Introducing the glow in the dark Angelfish and Convict cichlids (pictured above), hot off the backs of the fluorescent Zebra danios and ricefish, called Glofish, which glow under black light. One of the worst fish on this list is also one of the most long standing – the Bubble eye. Those huge fluid filled sacks affect swimming ability most of all, but also eyesight, and are a risk to the fish's health if they get caught, torn or popped and then become infected. 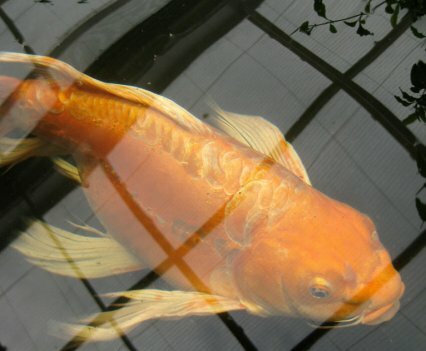 Add large bubbles to a missing dorsal fin, large, twin tail and centuries of line breeding, weakening the fish, and you get a very unlucky goldfish. OK, so the Parrot cichlid is a hybrid of at least two species – the Severum and Midas cichlid – only they have then been selected for the balloon, short bodied form and have deformed mouths. Then add on injection of dyes, tattooing (pictured above) and even tail docking to form "heart parrots" and you have another victim of man's strange, cruel ways. What's the definition of irony? A fin-nipping fish that nips its own fins perhaps? Long finned fish are long established and very popular, like male guppies and Siamese fighters for example, but they don't nip fins. Line breed a known fin-nipping species like the Serpae tetra to have long fins and when you keep a group of them – like you should with all tetras – they bite each other's fins! Tell a proper Koi keeper that you like long finned Koi carp and he or she will look at you like you have just insulted their own mother! To the purists the long finned Koi is an abomination and we have to say we are inclined to agree. All that size, power, grace and elegance while swimming reduced to an awkward waddle. Picture by Molly Stevens, Creative Commons. Are these siamese twins man made? We would argue that they are, as they were produced in an arowana farm, albeit as a freak occurence in a spawning. 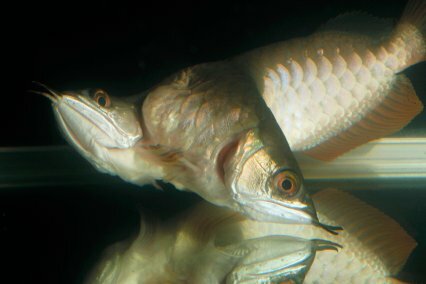 Instead of being spat out in the normal way by the parent though, which in the wild would mean deformed fry spiraling down to the river bottom where they would be eaten, this two headed arowana was hand stripped, and artificially reared. Another poor victim of cross breeding for cosmetic and financial gain, the hybrid Flowerhorn cichlid originated from crossing the Trimac cichlid with a whole host of other Central American cichlid species and seeing what came out. Some were more colourful versions of Trimacs with better patterning but still all the attitude, while others developed larger nuchal humps. About a decade on those humps are getting seriously large – too large – and short bodied fish are also being favoured (which are missing vertebrae), but the unluckiest of all get their tails chopped off with no anaesthetic! The Chinese call them lucky but a modern Flowerhorn maybe anything but. Picture by Lerdsuwa, Creative Commons. And what do you get when you cross a Flowerhorn with a parrot cichlid? A Parrothorn of course! Some say that Flowerhorns and Parrot cichlids are sterile, so the origins of this fish are not quite known. 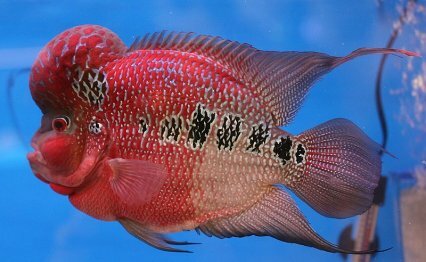 They could in theory have just produced this Parrot cichlid-looking fish with the Flowerhorn pattern just by selecting successive generations of deformed Flowerhorns, but either way, of interest to the minority of fishkeepers but horrific to most of those who appreciate cichlids in their natural form. 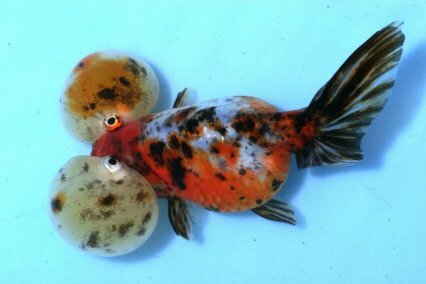 The breeding of shortened bodies in ornamental fish is actually quite common. Fancy goldfish were first of course, though some seem less shocking because they have always been that way throughout living memory. But take a tropical fish that we like and appreciate in its natural form like the Ram or this Pearl gourami for example and it looks pretty shocking. Balloon fish are missing vertebrae so are at a skeletal disadvantage when compared to their more able-bodied tank mates. One of the first artificial tropical fish to cause genuine outcry in the aquatic community, and one that PFK launched its well known anti dyed fish campaign off the back of. Glass fish were the first victims of being injected with dye via a needle, but since then we have seen Corydoras, loaches and Black widow tetras, let alone the poor old Parrot cichlid once again. PFK investigated this practice while in Singapore in 2007 and no matter what dodgy retailers may tell you, every one of those poor fish has been handled, and injected with dye, some with two colours. What's more, the Glassfish isn't a hardy aquarium fish at the best of times, and dyed specimens quickly succumb to Whitespot or Lymphocystis. Picture by quatermass, Creative Commons.